Book Rocky Mountaineer Train Tours Today! A Canadian Rockies train tour will take you through some of the most beautiful scenery in the world. There are few better ways to see the stunning sights of the Canadian Rockies than by train on the Rocky Mountaineer. And what better way to see the sights than by taking one of our one-way tours? 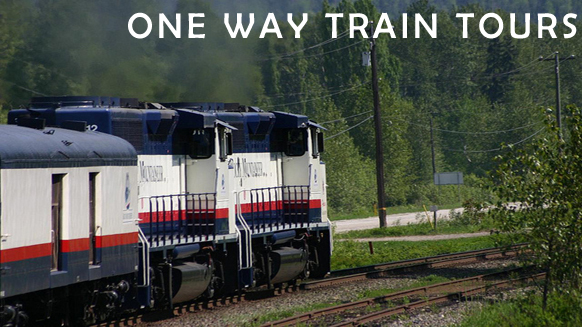 Our one-way tours allow you to enjoy the comforts of the Rocky Mountaineer and then continue on your vacation! Many choose to fly home from Vancouver if their one-way tour begins in Calgary or Banff. See what Canadian Rockies train tour works best for you! If you want to experience the Canadian Rockies, but you have limited time, this is the tour for you. This tour includes breakfast and lunch on the train both ways, transfers between the train and your hotels, luggage handling, and three nights in a hotel. *GoldLeaf includes GoldLeaf Service on the Rocky Mountaineer and upgraded hotels in Vancouver and the Rockies. This trip combines two days on the Rocky Mountaineer from Vancouver to Banff (our most popular route!) with two nights in Banff National Park, this five-night trip is excellent value for someone who wishes get the most out of their Canadian Rockies train trip. Also included is a trip to Lake Louise and a transfer to the Calgary airport–why visit Banff but miss Lake Louise, only 35 miles away? Experience the Canadian Rockies with the Rocky Mountaineer. This is one of our best short packages! Prices are lower in April, May & October. *GoldLeaf includes GoldLeaf Service on the Rocky Mountaineer. Stay a spectacular night at the Chateau Lake Louise, soar with the clouds in a glacier helicopter tour, enjoy a barbecue steak lunch at a working ranch, and a motor coach tour of Banff. You’ll stay in Vancouver, Kamloops, Banff, Lake Louise and Calgary on this popular five-day tour. *GoldLeaf includes GoldLeaf Service on the Rocky Mountaineer and a lakeview room at the Chateau Lake Louise and upgraded hotels in Vancouver, Banff and Calgary. Overnight stays in Vancouver, Kamloops, Jasper, Chateau Lake Louise, Banff, and Calgary will follow two days on the Rocky Mountaineer. Tours of Jasper, the Columbia Icefield, Yoho National Park and the Banff Gondola are also included on this popular Canadian Rockies train tour. Available April 24 – October 3, 2012. *GoldLeaf includes GoldLeaf Service on the Rocky Mountaineer and upgraded hotels in Vancouver and the Canadian Rockies. On this Canadian Rockies train tour, you will ride the Rocky Mountaineer between Vancouver and Whistler, another two days on the Rocky Mountaineer between Whistler and Jasper, and motor coach tours through popular towns in the Rockies: Jasper, Lake Louise, Banff and Calgary. Prices are lower in May. *GoldLeaf includes GoldLeaf Service on the Rocky Mountaineer and upgraded hotels in Vancouver, Whistler, Jasper, Lake Louise, Banff and Calgary. This glorious sightseeing package includes six nights in the Canadian Rockies and two days on the Rocky Mountaineer. You will travel between Vancouver and Jasper National Park. This tour also gives you your own car or motor coach tours of Jasper, the Columbia Icefield, Banff and Yoho National Parks. Available April 23 – October 1, 2012. Length: 9 Nights/ 10 Days. *GoldLeaf includes GoldLeaf Service on the Rocky Mountaineer and luxury hotels in Vancouver, Jasper, Lake Louise, Banff and Calgary. Learn about the Canadian Rockies train tours different levels of service! We are available to help you make your travel experience in the Canadian Rockies as pleasant as possible. Travelling in May is the best option, as winter is over and the prices are lower than they are in June, July, August & September. July and August are the two busiest months in the Canadian Rockies, so plan your trip accordingly!